To calculate Effectiveness of Evaporative cooler. Duct : 500 x 500 x 800 mm Duct in which evaporative coil is fitted. Evaporative Coil : Hot water is passed through evaporative coil made of copper. Air Fan with Motor : This suction type air fan is fitted on the top of the duct. Hot water cir. pump : 1/2 HP. 230 V AC hot water circulating pump is used to circulate hot water into the evaporative coil. Cold water Cir. pump : 1/2 HP. 230 V AC cold water circulating pump is used to circulate cold water which spray on the evaporative coil. 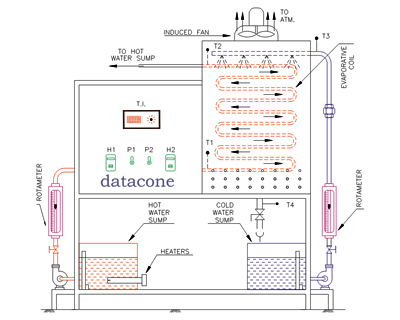 Heating Arrangement : Evaporative cooler provided along with geysers. Supply Tank : 300 x 300 x 450 mm storage tank one each for hot & cold water. Switches for Heaters, pumps & Air fan.